Finding time to work out with small children can be a challenge. 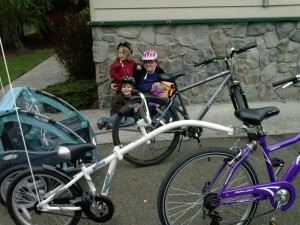 One way to manage is to find an activity you can do with your kids, and one option to consider is biking. We considered trailers, carrier seats that attached behind, carrier seats that attached in front, and even bakfiets or cargo bikes. A great post about options can be found at totcycle. We borrowed a trailer from a friend to get a feel for who could fit where and which parent could pull the weight. For my children and budget, we settled on a trailer for the two little ones, and a trail-behind bike for the older one who was not yet capable of riding in a straight line. My 5-year-old loves being part of the pedaling action, and the 1- and 3-year-olds nap, watch out the window, play with little toys, or “read” books as we go. We start with the basics: In our family, everyone wears a helmet — from the smallest trike to trailers to adult. We found it easiest to just make it an across-the-board rule, and like all areas of our parenting, we model the behavior we expect: Using and teaching hand signals. Discussing why we follow the rules of the road. Obeying traffic signs and signals. Teaching them to keep an eye out for traffic, road hazards, and other people. As the adults, we check all of our gear before we head out: helmets, tires, connection, brakes, safety flags. We follow the rules of the road, with some common sense and awareness that many motorists are not on the lookout for cyclists. You would need to check the laws in your area. Start small. Trips around the block, to the local school or corner shop. Always have water, and snacks are a great help in keeping small children comfortable. It doesn’t hurt you, either, as hauling that extra load can make you ravenous. Take frequent breaks, taking time to connect with your trailer kids and teaching riding children simple stretches. Make plans for your destination the kids can feel motivated by. My favorite thing to do is encourage them to become your cheer section. It keeps me going, hearing my son yell out as we climb a steep hill, “Go, Mama! You can do it. We are almost there!” As always, respect your children’s cues as best you can if they’re needing your attention. Believe me, I know sometimes there is nothing else you can do other than muscle through and get home. But, try to keep validating their upset as you do it, and make a plan with them for next time. 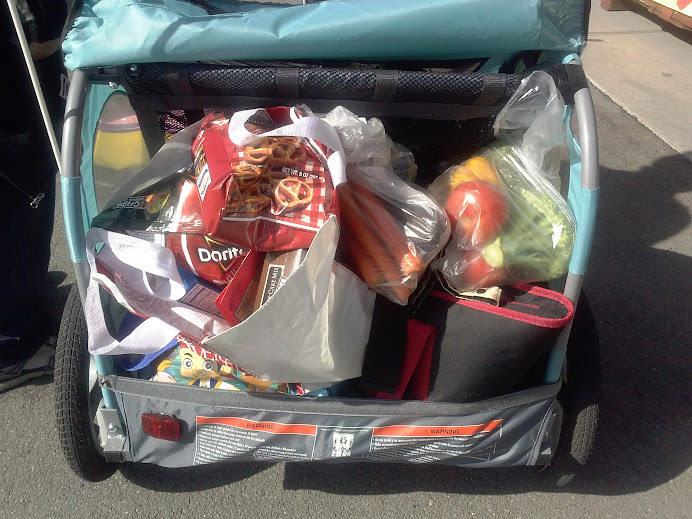 We may have have exceeded the suggested weight for cargo space but were within the limits for the cart. 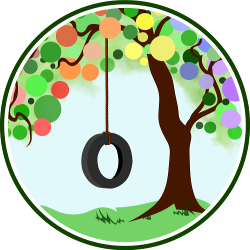 Find your motivation, engage your children, model an active lifestyle, and most of all HAVE FUN.